This Website Is No Longer Active. : Watching Paint Dry. Again ! How different the BNP is to the " Three Stooges " Election Debate Tonight ? Anyone who has ever told the truth and been the whistle blower has never been popular in life. Do you wonder why there is so much venom in the media against the BNP? The BNP dares to tell it as it is. 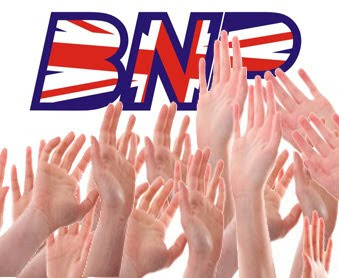 In society that seems to be wrong, the BNP is the person at the back of the room when your in a meeting at work and asks the awkward question to the boss. The BNP is the person who questions the change in policy of a company, when everyone else just moans about it but does nothing. The BNP is the person who will get told to sit down and shut up because they ask the awkward questions, that others only think but dare not ask. A vote for the BNP in this election is exactly that, a vote for the BNP. It will be frowned upon it won't be liked you may even be attacked but you will be doing the right thing. A vote for the Lib Dems will only bring Gordon Brown back in as Prime Minister. A vote for the Tories will only bring in a hung parliament and another election and yet more wasted money. A vote for Labour will only make them say what they have done to destroy this country over the past 13 years was ok.
A vote for UKIP will be analysed as a vote that the Tories would have got? So vote BNP, because every vote really does count. For every vote the BNP does not get the hordes of a naysayers will say that the population of Britain is happy with the high immigration levels, that they have rejected our stance and want a multi cultural society. A vote for the BNP can only be seen as enough is enough. You want your country back! You want to stick two fingers up at the establishment! There is no better way than by voting BNP. The only party which truly is BRITISH. The only party which truly says it as it is, and that is why they are so hated by the establishment and the media. The only party fighting for " Justice for Linda Lewis " and her daughter. VOTE BNP BECAUSE YOU WILL BE VOTING FOR THE BNP.